This is the image of the newly designed Yahoo! search in the United States of America. Yahoo! seems to have let go its decade old search interface in keeping with changing times. The new design as per Yahoo will give out relevant results front and center, and is consistent with their newly designed homepage. In addition to a new design, Yahoo! also claims to have fed it some under-the-hood performance improvements that enables the pages to load faster. "Over the coming months, you’ll see more from Yahoo! as we work to deliver a search experience that combines utility with beauty and gets you to your results faster. Today’s news is just our first step,"
Looks like with the acquisition of Tumbler and the complete refurbishment of Yahoo! Marissa Mayer will take Yahoo! back to its old glory days. The email interface was changed in the month of December, 2012 and now the search interface, makes it seem that Yahoo! is fast peddling its redesign schemes. If you haven't checked the latest Yahoo! mail interface do it now. And by the way if you want to check out the latest Yahoo! 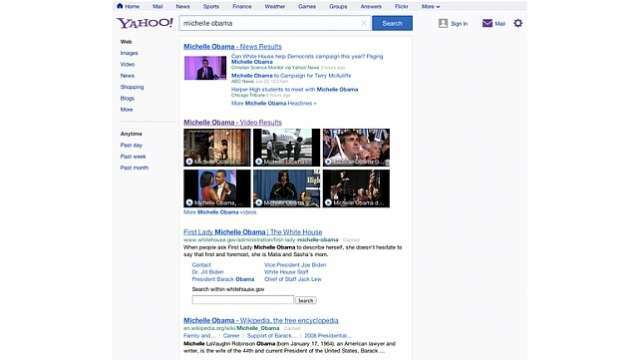 search interface, type yahoo.com and select yahoo.com when prodded at the top of the page.